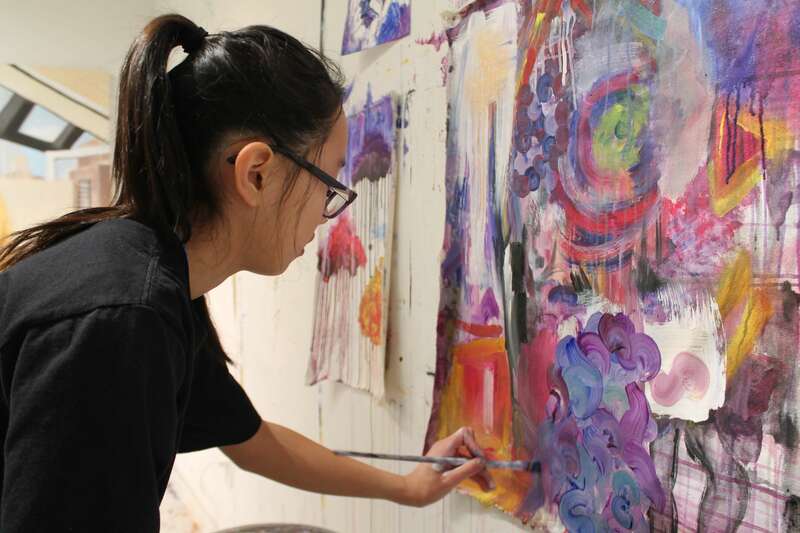 Sophia Shin is a collector - she steadily accumulated many objects, discarded cups, sticks, cd's and drift wood over the course of the Art Affects semester and let herself play and paint at the same time. This afforded Sophia a poetic and beautiful body of work that reflects her interest in abstraction and remnants from her daily life. Painting for her, is not limited to canvas, I was and am continually impressed with her bravery to paint on any surface and in any way she wanted to. She trusts her impulses and it shows. Sophia's work is weird, and she's positively happy about that. Gatti is not afraid of making an uncomfortable painting and letting the viewer stand in confusion. For an 8th grader, this is not only brave but telling of her strong instincts and interest in painting as story telling. Mostly figurative and based off of continual drawings, Sophia uses her canvases to begin a story and is confident enough to let the viewer finish it however they may want to. Dillon’s ambitious painting puts an interest in painting and the digital world together. Dillon’s ability to paint and solve problems is strong and his work reflects this. Digital media, animals and paint all come together to form the way Dillon approaches his paintings. Dillon’s ambition and technical mastery are so strong for his age - his work reflects a culture that is important to him and it shows. Idan is an attentive drawer and observer. Continually interested in the human form and how endless drawings can seep into and become one - Idan’s work comes from constant motion and an incredibly sharp and refined draftsman technique not typically seen for his age. Idan is a true artist, in that he is always curious about looking and communicating - and never sits in a strict logic that his way is the best way to communicate. 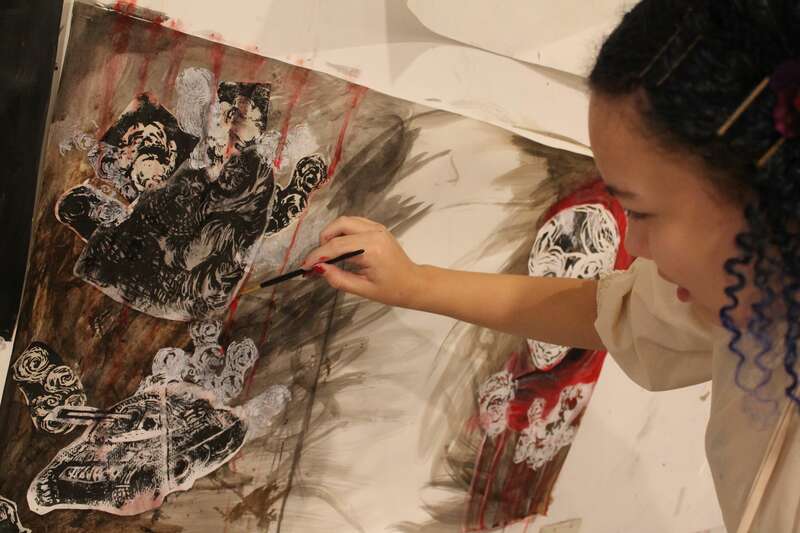 Katrina’s interest lie in sketching, storytelling, architecture, and digital media Experimenting in materials, such as mirrored glass, acrylic paint, pencil and drawing apps on the iPhone, she painstakingly plans each work, yet somehow the result is fresh and organic. Often creating grids, lists and sourcing digital colors, Katrina creates poetic works that reflect the culture and fantasy she values. Focused on self identity and relationships closest to him, Guy’s portraiture, conveys his love of theatre and performance, but also has the intimacy of heartfelt self realization. A remarkably skilled draughtsman for his age, each work starts in realism, often sketching from a photo, but quickly turns into gesture, form and color - fueled with love, angst and acceptance. Interests in the human form and what makes them are the basis for Gefen’s work. Boldly colored portraits of people she knows or shares an affinity to are painted on both sides of lucite sheets. Shapes colors and forms on one side, and a more realistic rendering on the other, these works express the duality felt of someone her age, who they appear to be and who they really are. When grouped, they begin to tell bold stories, remarkable for someone so young. Isabella, dually interested in both psychology and painting, is drawn to time and place through the landscape as subject. 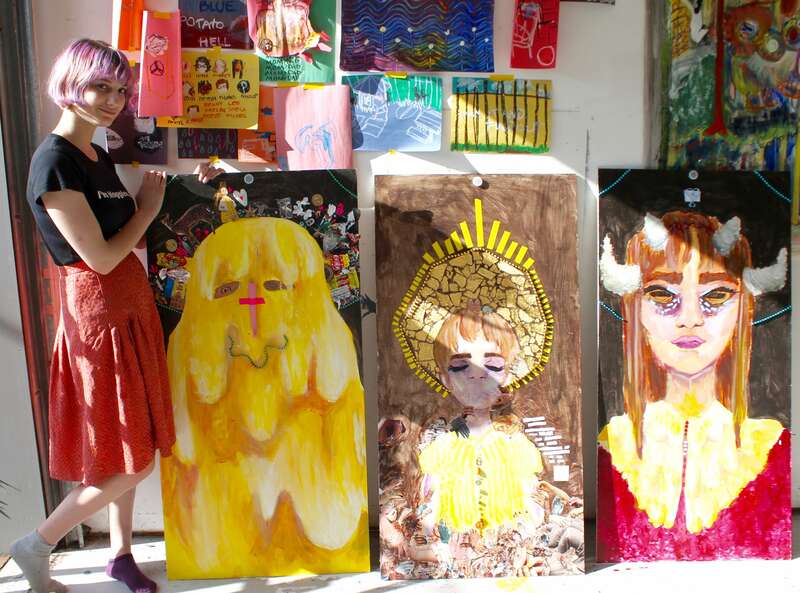 In some of her paintings, figurative forms appear in the sky like clouds - the weirder they become is a reflection of Isabella being confident in both what she wants and what she observes. Patient and calm, Isabella observes her life and paints it in a way that streams her attention and skill together gracefully with her beautiful and strong paintings. Grace creates collages addressing world topics and ad culture. With these as her sketches, she focuses on sections, abstracting colors and forms to create paintings, no doubt coming from her wanderlust and political interests - the work becomes, current, inquisitive and vital. Equally exciting, her domestic and urban scenes, void of humans suggest a questioning of who she is and where she belongs, reinforcing the collage work even more. © 2019 One River School Englewood. All Rights Reserved.